There is love coming, it’s close. Maybe it’s already here, can you see it, feel it? Or are your walls up, protecting you from the pain of it, the agony of the past creating blinders to shield you from the fears of reliving the same? Are you open and willing to receive love? Or are you hiding your heart safely away behind lock and key? If you want love, you must open up to it on every level. Self-love, Divine Love, Universal Unconditional Love and connection. Then you can have your twin flame love, your true romantic love and all that goes along with it. Let the past go. Honour your experiences, the lessons learned. You don’t have to do them again if you acknowledge and release them. Make space for something new. Your heart is resilient, it is powerful and courageous. Open it back up again, and let it lead you. Be the love you wish to experience. Accept yourself fully and allow others to be themselves, accepted without judgment. 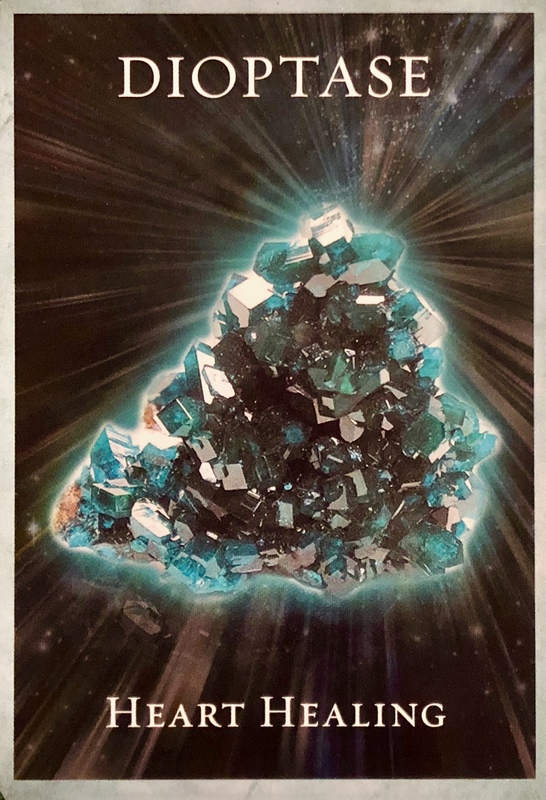 Dioptase can help you heal and expand beyond what you have yet to experience. It can assist you in letting go of the petty in relationships and seeing the bigger picture. It is not a common crystal, and not always affordable or readily available. But you can accept the healing by tuning into the frequency and asking for it to take place. Use the image in the card to connect. If you are a crystal collector and have a piece, place it on your heart chakra at night before sleeping and then under your pillow for the next few days as the healing takes place. The shift will be obvious; no matter how you facilitate the healing it will be transformative.